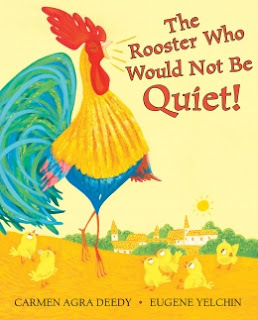 That's Another Story: THE ROOSTER WHO WOULD NOT BE QUIET by Carmen Agra Deedy & Eugene Yelchin - A picture book to honor those voices that can't be silenced. THE ROOSTER WHO WOULD NOT BE QUIET by Carmen Agra Deedy & Eugene Yelchin - A picture book to honor those voices that can't be silenced. For the month of March, I’ll be reviewing picture books that have birds in them in some way. My mom, who recently passed away, loved birds. For many years, she had canaries or budgies. She also studied ornithology through Cornell University. She and I spent many hours watching birds together. Since her birthday is in March, this seems a fitting way to remember her. The Rooster Who Would Not Be Quiet was written by Carmen Agra Deedy and illustrated by Eugene Yelchin. It was published in 2017 by Scholastic Press. I enjoyed the humor in this story: Even the teakettles were afraid to whistle. The repeated phrases and the problem of how the mayor is going to stop the rooster provide momentum to carry the reader along, keeping us wondering what is going to happen to this noisy rooster. This story is interesting because the text seems longer than many recent picture books I've read. The illustrations are fun, bright and fit really well with this text. But a song is louder than one noisy little rooster…And it will never die—so long as there is someone to sing it. I really like the message behind this story about how our voices are important. The author has a lovely note at the back: “Much like roosters, human children are born with voices strong and true—and irrepressible.” As a kindergarten teacher, my goal is always to help children to use their voices to express themselves without silencing their spirit. Even without thinking about the message behind the book, this is a fun read for children and could lead into some discussion about noise. It would also be fun as part of an inquiry about the noises around us. Discuss: Why did the rooster keep singing? Play a listening game: Have the children close their eyes while you walk around and rattle or shake things in the room to make a sound. Children can then open their eyes and guess what made the sound. Nature: Go on a listening walk. What sounds do you hear around you? How many different sounds can you hear? STEM: Challenge students to build a machine that can make noise. Finding and using ones voice is so important early in life. I love that theme and the focus on nature. Sounds like fun! Great pick! Looking forward to your bird theme picks this month! Thanks, Joanna. It's a cute one!